This article originally featured in the April 2019 issue of Homeland Magazine and is republished with permission. After earning a bachelor’s degree in early childhood education in 2010 from her hometown Dalton State College, it never occurred to Meg Garrison that two years later she would forge a new path where she would be spending her life, 24/7, serving the military community. But that is exactly the life that this selfless Georgia native chose for herself after she came to the aid of an injured childhood friend in his time of need. Garrison is now Meg Jones, the spouse of combat-wounded U.S. Marine Staff Sergeant and EOD Technician (Ret.) Johnny “Joey” Jones. She also is a step-mother to nine-year-old Joseph Jones, and the Programs Director with the Texas-based national military non-profit Boot Campaign. Meg met her husband-to-be at Southeast High School in Dalton in 2003, and upon graduation, she headed off to college and he was off to a career in the Marines. Meg and Joey were not in a relationship on Aug. 6, 2010 when Joey stepped on an improvised explosive device (IED) in Afghanistan, resulting in the loss of both of his legs above the knee and suffered severe damage to his right forearm and both wrists. After learning of the injury, Meg found herself in Washington D.C. and began helping Joey battle through two grueling years of recovery at Walter Reed National Military Medical Center. 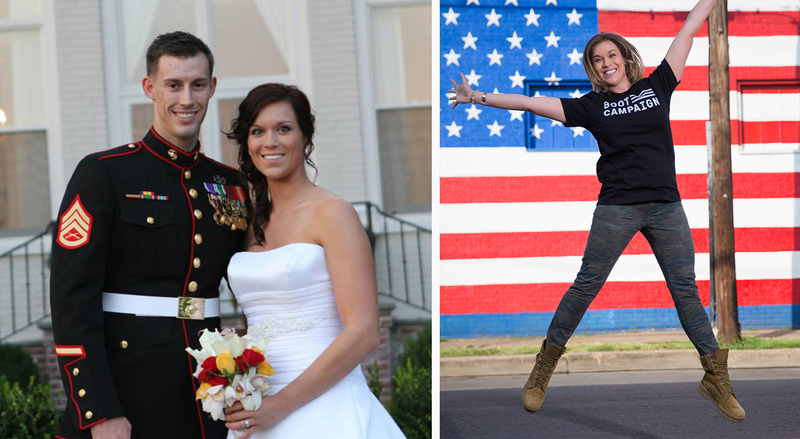 The couple were married in the nation’s capital at Marine Corps Barracks 8th & I in 2012, and since then she has had a fast and furious education into the military community ever since. According to her husband Joey, it was a phone call he made seeking inspiration that brought the two back together again – a call he will be forever thankful that Meg answered. Even though her grandfather Lloyd Keith was a U.S. Army World War II veteran and her father Allan Garrison was a first lieutenant and “Huey” utility helicopter pilot for the Army in Vietnam, Jones says she never quite understood the military life her “Papa” and “Dad” experienced as details were not shared with her during her youth. While she always has been 100-percent committed to the new direction of her future, the transition did not come as easily or smoothly as some might assume. Being supportive to her step-son Joseph also was high on her new list of priorities, especially after majoring in early childhood education and beginning her career at a small non-profit organization developing materials for and running an initiative for children. Although it has had its share of ups and downs, she treasures her relationship with Joseph and considers it a blessing. “Joseph is Joey’s miniature doppelgänger, and he brings so much joy to our lives,” Jones beams. “Joey and I are always looking for new and exciting things to do as a family with Joseph and we cherish our time with him. She says the situation also reminded her of just how special and strong military children can be in general, no matter what uncontrollable circumstances come their way. “For me, the incident at school with Joseph was a very eye-opening moment to see how resilient he was and how well he handled the situation,” Jones reports. “Military kids are some of the most dynamic people I’ve ever met. The Jones family first learned about Boot Campaign from hearing a 2011 XM radio interview with Joe Nichols, a country music artist and Boot Campaign celebrity ambassador. Eventually, both Joey and Meg ended up working for Boot Campaign full time. Joey ultimately served as chief operating officer until leaving for other ventures in 2017, and Meg currently serves as programs director. As programs director for Boot Campaign, Jones is on the frontline of the organization’s veteran assistance and awareness programs. She ensures candidates receive treatment as part of Boot Campaign’s revolutionary health and wellness program, arranges for veterans’ families to receive gifts and assistance during the holidays through the Santa Boots program, and encourages the public to “Lace Up America!” by purchasing Boot Campaign combat boots. Jones is unapologetically proud of the organization she represents and is confident she and her fellow colleagues will continue to ignite patriotism in the spirit of providing life-improving programs for veterans and military families throughout the country. “Boot Campaign is like no other military non-profit that myself as a military wife has ever experienced,” Jones says. “Our staff, supporters, and partners truly care about the well-being of those who serve and have served. Brain Injury Awareness Month - What is TBI?